The sensor is a mouse encoder wheel LED/phototransistor pair, with a turned aluminum disc that has a hole drilled in it, as the encoder itself. Anyway. The arduino code works fine. The schematic, however, has a problem: if you wire it up just as this says, the phototransistor output is always at about Vcc: the analog input to the arduino measures between 1017 and 1023 no matter how carefully you block the phototransistor. But the moment you go to measure the voltage coming off the phototransistor with respect to ground, it works perfectly: any bit of anything blocks the lightbeam and the output goes to a fraction of a volt. The meter’s input impedance drags down the output and makes it work. It’s hard to troubleshoot something that works when you’re measuring it, and only doesn’t work when you’re not measuring it. 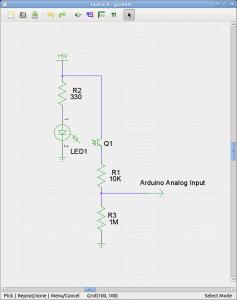 A 1 megohm resistor between the output and ground makes it work great. Tomorrow I’ll add an LCD rather than having to keep a laptop in there to see the RPM, and a bit later I’ll turn the whole thing into a standalone board on the back of the LCD, but for the moment this will do.